With an abundance of history and culture alongside job opportunities and a buzzing nightlife, property for sale in Newcastle is a tempting prospect. Wherever in the country you are looking, buying your first home comes down to what you can afford. And this is based on the size of your deposit, how much you earn, and how high your outgoings are. But working out the finer details isn't always as straightforward. This is where Zoopla can help you narrow down your search. 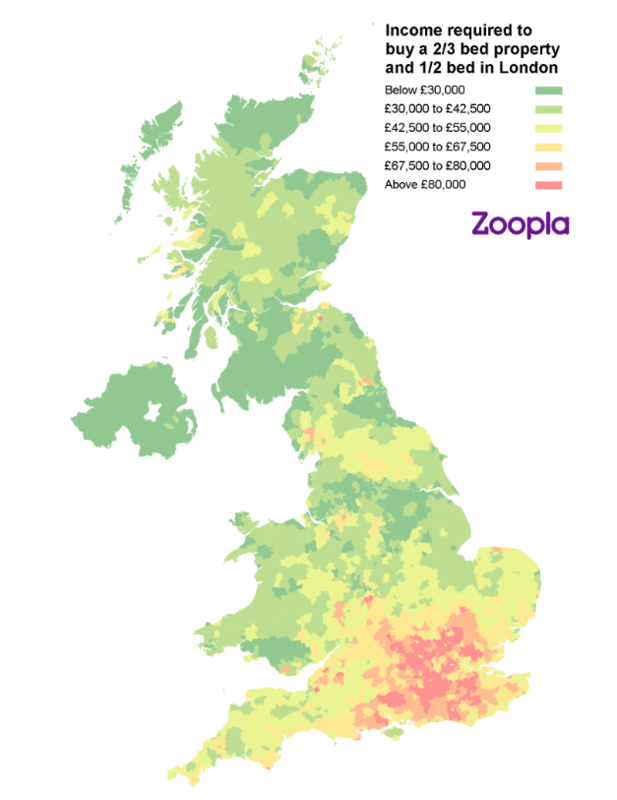 Our data looks at average house prices by area to show how much you would need to earn and save for a deposit to get the keys to your own home. This guide is all about Newcastle in North East England, with our map below highlighting the areas that are most affordable for first-time buyers. The average first-time buyer property (two-to-three-bedroom house) in Newcastle costs £141,844, with the average deposit required standing at £16,418. The average income required from a first-time buyer household is £31,356. 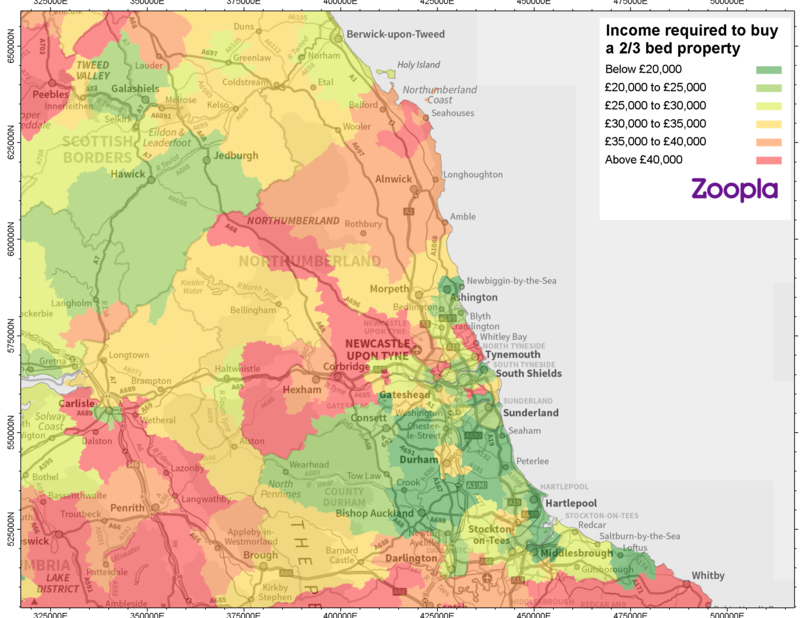 Stanley (DH9) to the south of Newcastle is the most affordable places to buy, with an average property price of £70,044 and a required household income of £15,484. The area easily meets lenders' typical four times earnings criteria for mortgages, as you can get on the property ladder for 2.62 times local earnings. For those looking to get on the property ladder close to the action, NE4 to the west of the city centre is worth investigating. It contains Fenham, Westgate and Wingrove and prices stand at £94,346 – well below half the national average for first-time buyers of £233,777. Ponteland in NE20 is Newcastle’s least affordable area, with an income of £71,247 required for a first-time buyer and average house prices standing at £322,295. 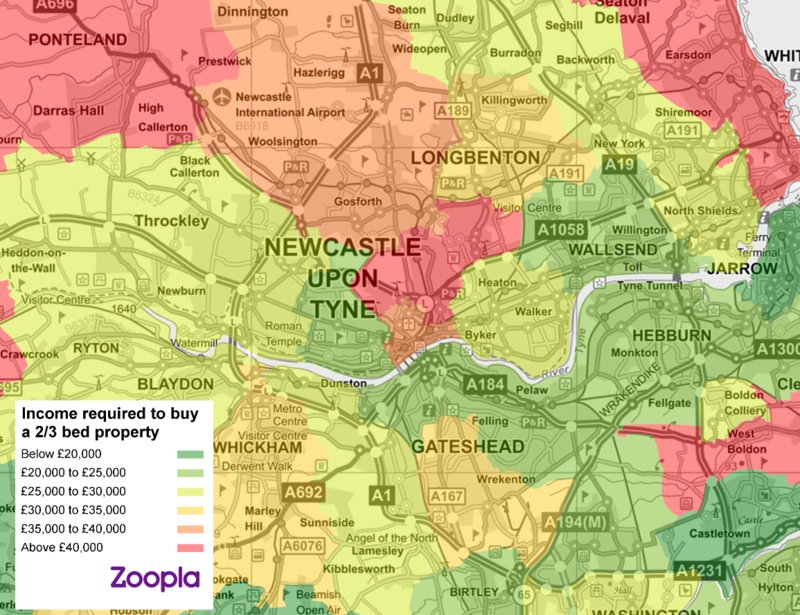 We've looked at the average price of two-to-three-bedroom homes, the most common type of property purchase for first-time buyers in all Newcastle postcodes. One of your top priorities as a first-time buyer should be to build as big a deposit as possible. This will allow you access to better mortgage rates, as you will be borrowing a lower percentage of the overall value of the property. Try to aim for a 10% deposit at a minimum. It is possible to put down a deposit of just 5% in some cases, but this means paying a higher interest rate on your loan and costlier monthly repayments. The Government offers a range of schemes designed to help you get on the housing ladder. Help to Buy for example, is where the Government lends up to 20% of the purchase price interest-free for the first five years. However, you will only be able to use it on a new-build home valued up to £600,000. Provided your credit score is in good order and your outgoings to do not limit your ability to repay a mortgage, banks and building societies will lend up to four times your salary. If you are buying as a couple, then combining your incomes will boost your affordability. Once you know how big a deposit you have accumulated and understand how much you might be able to borrow, you can assess how much you can afford to spend on a property. You can then get your search underway. Make sure that you also budget for other fees that pop up along the way, such as solicitor and moving costs. The good news is that stamp duty land tax is waived for first-time buyers on the first £300,000 of the purchase, providing the home is worth under £500,000. 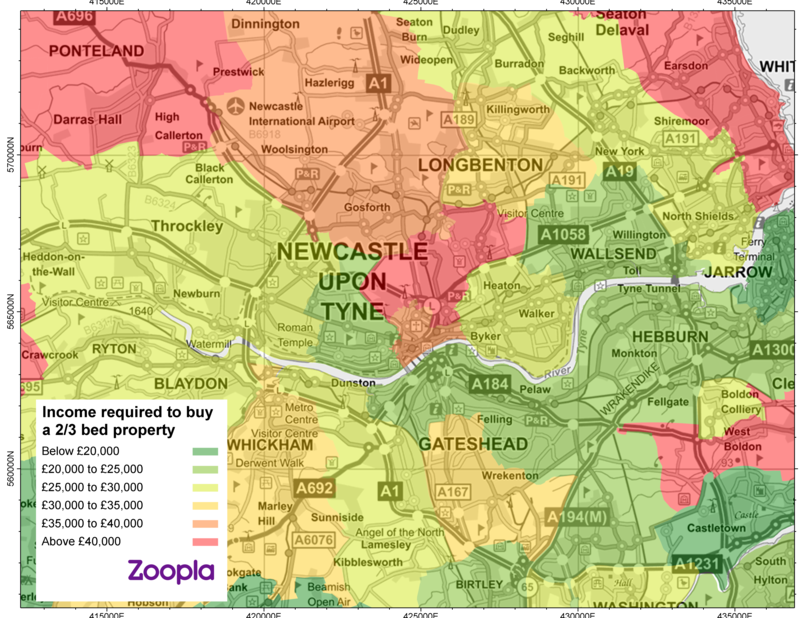 Homes for first time-buyers in Newcastle are pricier in comparison to the wider region. Properties in North East England cost first-time buyers £127,131 on average, requiring a deposit of £14,715 and a household income of £28,104. For other affordable options you can head south to Middlesbrough, where in the town centre (TS1) you can buy a property for just £51,615, with a deposit of £5,974 an income of £11,410. If you want to be by the coast, Hartlepool is also well suited to first-time buyers, where areas including the town centre and Hartelpool Marina (TS24) contain homes that require a household income of just over £16,000. Sunderland could also be on the cards, with both SR1 and SR5 having properties available for close to three times local earnings ratios. If you're willing to broaden the horizons of your property search, then our first-time buyer affordability map of the UK, will help. 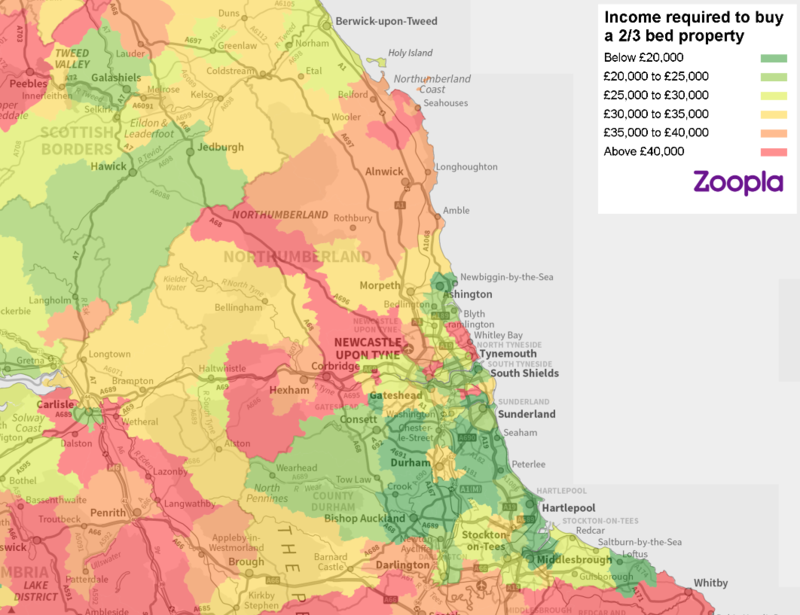 There are still plenty of areas where those with household earnings of under £30,000 can afford property, especially in the North. But property prices vary even from street to street, so do your research of the so-called 'micro markets' in any given area too.